Classic and modern Sonic bounce on fungus in these challenging 3DS stages. 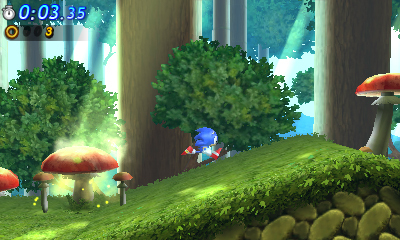 Sega's Sonic Generations features a collection of stages from the Hedgehog's past, including the fan favorite Green Hill Zone. Well, now we can add the Mushroom Hill Zone to the list. These old school boards first appeared in the Genesis hit, Sonic & Knuckles back in 1994. From the look of the screens, Classic 16-bit Sonic explores the green (spring) Act 1 environment, while Modern Sonic rail grinds through the fall inspired Act 2. After the success of Sonic Colors (both on Wii and DS), hopes are high that Sega will deliver once again with a fun and visually stimulating adventure. That said, although Sonic hasn't faired so well on consoles, his handheld resume is by far the best. We certainly hope the 3DS Generations continues the tradition of cool portable Sonic games.